mainstream adoption. The Apple Watch is expected to change that — much like how the company's iPhone jumpstarted smartphone sales back in 2007. But are people ready to ditch traditional watches and bracelets for wrist-mounted mini-computers? That's just one question that a new study, conducted by retail research firm First Insight, tried to answer — and its findings may surprise some. "We were very surprised to find that women not only loved the Apple Watch — they were actually willing to pay nearly $50 more than market price for the Apple watch when buying it for themselves," First Insight's chief marketing officer Jim Shea told Mashable. "[It] appears Apple has an opportunity to create a smartwatch specifically designed to appeal to women, and charge even more for it." This piece of data would seem to validate Apple's strategy of positioning its wearable as a fashion accessory, rather than as a geek-centric mobile gadget — thereby priming the market to pay a premium for the device. In the months following its unveiling, the Apple Watch appeared on the cover of Vogue China, and company design chief Jony Ive showed it off at a special event in Paris for Vogueeditor-in-chief Anna Wintour and designer Karl Lagerfeld. 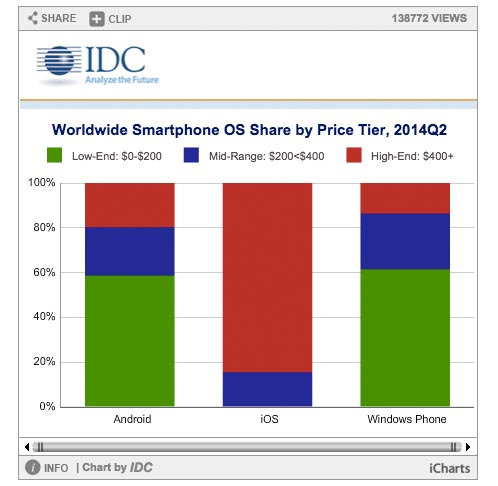 If you're an Android fan, however, the study brings good news: It's not all about the Apple Watch. "The Samsung Gear S had the highest positive consumer feedback (48% positive), but its price point ($399) got in the way," Shea said. "If Samsung were to lower the price of the Gear S to what consumers deemed reasonable ($287 on average), they could be the watch to beat." That price sensitivity for wearables would seems to mirror smartphone-market trends, where consumers on a budget tend to go for Android devices when choosing between iOS and Android, the two leading mobile operating system platforms. The smartwatch study, which was conducted on Nov. 18, received responses from 966 consumers across the demographic spectrum. It asked questions about the leading wearable devices, including the Apple Watch, the Pebble Steel, the Motorola Moto 360, the LG G Watch R, the Sony Smartwatch 3, the Samsung Gear S, the Meta M1 Smartwatch and the ASUS Zenwatch. 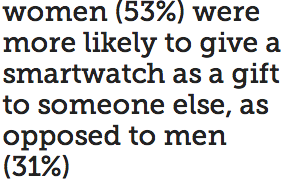 One particularly interesting finding was that women (53%) were more likely to give a smartwatch as a gift to someone else, as opposed to men (31%). However, when it came to buying a smartwatch for themselves, men (38%) were more likely to purchase one than women (22%). In general, the study found that roughly 73% percent of consumers are considering buying a smartwatch for themselves or someone else this holiday season — great news for the companies taking a chance on what is still an emerging category. "Overall, consumers are looking for smartwatches that look like real watches," Shea said, "[and] have fitness tracking capabilities and have a remote shutter button for a camera phone." 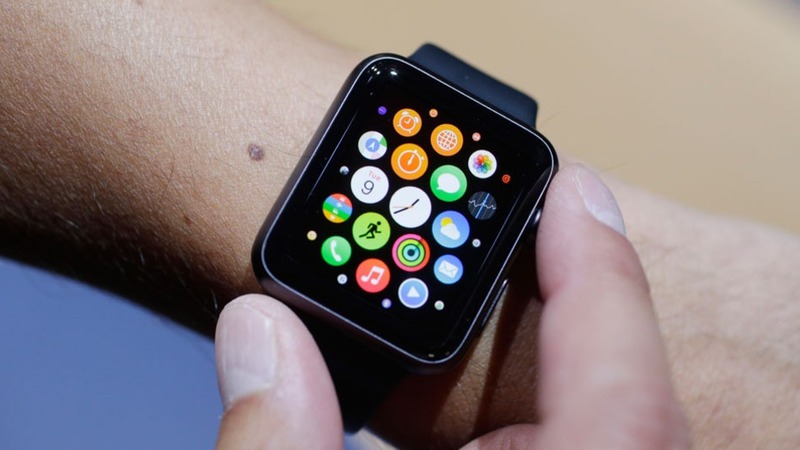 Of course, polling nearly a thousand shoppers isn't the final word on the future of wearables; but it does give us several solid clues regarding consumer interest and what smartwatch makers must do to compete in a space that is about to be transformed by the highly anticipated Apple Watch, expected to debut in spring 2015.